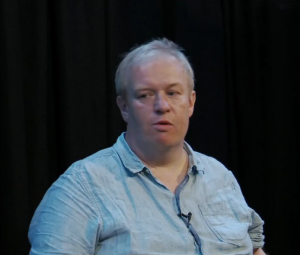 Traverse in Time is a series of panel discussions that look back at the rich history of Edinburgh’s Traverse Theatre, and the individuals who were involved in its illustrious past. Taking place at Summerhall on Thursday 8th August 2013, this is the fourth of ten discussions and features playwright Peter Arnott. In 1985, the Traverse Theatre asked an up-and-coming young playwright called Peter Arnott to write a three person play for the Edinburgh Festival. White Rose centred around the story of World War II fighter pilot Lily Litvak who was nicknamed ‘The White Rose of Stalingrad’. She was one of many outstanding female fighter pilots in the Red Air Force. Since then, Arnott has become one of Scotland’s best known dramatists, with works including The Breathing House and The Infamous Brothers Davenport.